Continuing their acclaimed performances of the great Bach vocal works in Harpenden, Amici Voices will perform his masterpiece, the Christmas Oratorio, for the third time at the High Street Methodist Church. This will be their seventh concert in Harpenden and follows their hugely popular performances of Bach’s Matthew Passion and Christmas Oratorio in 2013 and 2014, and the John Passion in April 2014. 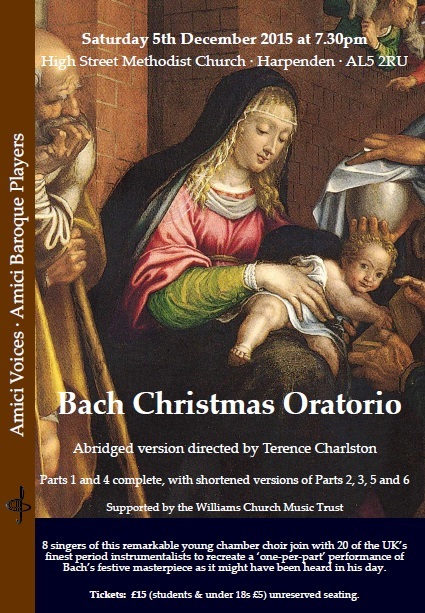 The Christmas Oratorio is a series of six cantatas each intended for performance on one of the major feast days between Christmas and Epiphany. The six parts are colourfully orchestrated and describe the birth of Jesus, the annunciation and adoration of the shepherds, the naming of Jesus, and the journey of the Magi. The performance will be sung in German in an abridged version with Parts 1 and 4 complete, with shortened versions of Parts 2, 3, 5 and 6. 7.30pm, performance will end by 10.00pm. Tickets: £15 (students & under 18s £5) unreserved seating.